Do you ever have days when you struggle with the blues? When your soul is downcast and your spirit troubled? OK. I admit it. I talk to myself. I don’t think I’m crazy, but what do I know? Some people may think I am, especially when I’m walking the dog and talking out loud to God. Come to think of it, I do get some funny looks, but sometimes I find it helpful to give myself a good talkin’ to. To express myself out loud. To vent. To give God emotions that are unhealthy and toxic to my spirit. When I’m troubled, I ask myself questions. My drama-queen-self doesn’t speak so eloquently, though: Nina, what in the world is wrong with you? For cryin’ out loud…snap out of it! Why are you so troubled? What is really bothering you?………God, I don’t like feeling this way, but I know You’re with me and I know you won’t leave me in this miserable place. Speak peace over me. We’re not alone in this struggle with our weak and imperfect little selves. Even King David–the great psalmist, the man after God’s own heart–had days like this. He struggled with the blues. Sometimes I even think he struggled with the mean reds. If you’ve never seen Audrey Hepburn in Breakfast At Tiffany’s then you may not know about the mean reds. When they reared their ugly heads, they had the potential to destroy Holly Golightly’s ability to hold herself together, to keep her fragile heart from being ripped apart by the pain of abandonment and betrayal. Holly wasn’t interested in love. So she thought. She was interested in wealth because it offered her the security she’d never known. She was convinced money would solve all her problems and a rich husband would make her life perfect. Whenever the mean reds attacked, Holly hailed a cab and fled to Tiffany’s, the famous jewelry store on Fifth Avenue in New York, where she found solace in diamonds and precious jewels. Tiffany’s was a symbol of Holly’s dream that money would buy her happiness, so she comforted herself in the lap of luxury. She felt safer in a jewelry store than in the comfort of her tiny, sparsely furnished apartment. Tiffany’s was her substitute for love. As any good love story, this movie has a happy ending. Holly finally surrendered her heart to a man who gave her the love she’d never known she needed, the comfort that Tiffany’s in all it’s earthly glory couldn’t give her. We can search the world over, but we’ll never find satisfaction or contentment in anything or anyone but God alone. We can hail a cab, we can flee, we can lose ourselves in our own personal “Tiffany’s”, but our troubled spirits will never find rest. Not the kind of rest we find in the lap of the one true God whose love guides by day and whose song serenades by night. When the mean reds threaten to sweep over me and swallow me in angry waves I may talk to myself every now and then, but the real comfort comes when I talk to God. When I pray. 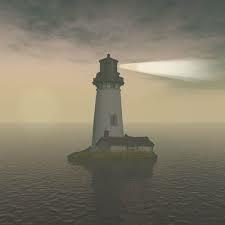 He’s my lamp in the darkness, the light on my path, and the beacon of hope in troubled waters. When the clouds of darkness roll in and the waves pound upon the fragile walls of my heart, I go to the Rock, the Anchor for my soul. My only hope of finding rest. Take heart, my downcast soul, my troubled spirit…the God of love will give you rest. I. will. not. be. shaken…. Yeh man…I like that, Larry.